"When boiling pasta, adding oil to the water will not prevent the noodles from sticking (and Gordon Ramsay's wrong on this). Oil floats to the surface anyhow. What keeps pasta from sticking is that it has enough room to move around in the pot, that you are stirring every few minutes, and that pasta must be garnished and served immediately. What really happens when you add oil to your pasta water is that as you pour the pasta into the colander, the oil will drop onto it and coat it's surface, making the sauce slid away; By the way, pasta does not need to be rinsed." "Searing in juices is a TV-chef myth. It comes up all the time on the TV, which doesn't make it any more true. In fact, the act of searing the outside of meat actually makes it more porous and therefore more likely to give off juices under pressure. This pressure does not have to be manual, the mere exposure to heat forces the muscle (almost all traditional cuts are muscles) to contract and therefore expel juices from the item. You can't stop those juices, but you can work with it. Searing at great heat and then finishing your meat at lower heat, letting it rest for a while after cooking and before serving, preserves the second-largest amount (top for that is still Sous Vide cooking) of juices." "I've noticed a common mistake is not knowing your oils. Biggest mistake I see is people cooking with olive oil. It has a super low smoke point and the flavor breaks down pretty easy. I keep a few essential oils and dabble in something more exotic if I come across it. High heat (searing, pan fry): Coconut oil, peanut oil, bacon fat (don't toss it, keep the fat and filter it once it cools down a bit). Medium heat (eggs, vegetables): Avocado oil, Butter (the good stuff like Kerrygold, cheap store brand has water in it). Low heat (drizzle over salads or steamed veggies): Olive oil, pistachio oil, walnut oil, or anything with a strong flavor that you want to preserve. If you want to try some more exotic oil on the cheap, Trader Joe's has a great selection. I picked up a 3 pack of 12oz each of walnut, pistachio, and hazelnut oil for $10 or so a while back that I love." 2) If you have time to be flipping the patty 20 times, you've overcooked it." "Don't just dump a load of salt and pepper into the mix at the last minute. Season every single thing, the veggies, the meat, the sauce. And if you're unsure of how much to use, just keep adding in small pinches and taste it. I like to think of it as salting in layers. Just little bitty pinches as you go along, gradually building up the salt. Remember, you can't un-salt! I also strongly encourage anyone who hasn't yet to try keeping their cooking salt in a little jar instead of a shaker or grinder-- something you can grab the salt out of with your fingers, so you feel how much salt you are adding. I find that it gives me the clearest and most consistent idea of how much I'm really using. Also if you can't taste the food due to rawness, two good turns on a pepper/salt grinder are usually enough. If any ingredients you are using are already salty, adjust accordingly. If you're wrapping something in prosciutto or adding parmesan to a pasta, hold back on the salt you use on the other elements. If you're making Asian food, the last thing that should be on your mind after adding soy sauce is, 'and last but not least, this needs salt.'" "Apparently, I am told, only homemade pasta is worth it. Well, that's a myth. Good bought pasta contains exactly the same stuff you'd put into it. Unless it's ravioli (in which case you have to make it yourself to get stuff inside), buying pasta is completely acceptable and done anywhere and everywhere, even Michelin-starred places. Clarification: Barilla and other durum-extruded pastas are different from homemade pasta in contents and taste. They're not worse or better, but different. When I refer to store bought pasta it's the stuff you buy at a pasta shop, not a supermarket." The reason for this is that moisture has to be cooked off before browning can occur. Moisture on the surface of the steak is going to evaporate, so instead of pan-searing it, you're steaming or boiling it. Salt will draw out moisture from the meat. If you dry it, then salt it and wait ten minutes, you will see more moisture on the surface. This is bad because that's flavor you're going to end up cooking off, so this is why you salt as it's going into the pan. Yet on the flip side, you can also salt in advance. Simply salt all sides and leave to rest on a wire rack. This will draw the moisture out but also allow for evaporation, which will remove moisture but still leave the flavor behind as it does so. Salting either within 3 minutes of or at least 40 minutes before putting the steak in the pan yields the best results. You can also lightly dredge your steak in flour, very lightly, like knock some of that off before you toss it in a pan. This will help build a fond which you can make a sauce of via deglazing and/or tossing a roux in the pan." What To Do If Your Dish Is "Missing Something"
"If it feels like your dish is 'missing something,' chances are it is acidity. Now this doesn't apply to everything, but I think a lot of people just don't think to add some lemon juice to a sauce or a stew, for example, and it can make all the difference. I always keep some fresh lemons at home because lemon juice in a bottle is usually just a chemical product. Vinegar is good for this, too." "Myth: kitchen gadgets will help you prepare meals quicker, and with ease. Truth: A bunch of easily-broken crap in your already-crowded kitchen drawers will not help you. Right down to the garlic press, get rid of them. The best tools you can have in your kitchen are four good knives: an 8-10 inch chef's knife, a longer, thin-bladed slicing knife, a paring knife, and a serrated knife. Have them sharpened regularly by a professional, and look for a cooking class that will teach you basic knife skills. You will be amazed how much more efficient you will become, how much space you will regain in your kitchen drawers, and how much MORE you will like cooking. And second to that, have 2-3 cutting boards made out of quality ingredients that are small enough to wash in your sink. Never use your knives on those ridiculous 'glass' style cutting boards." "Use real wine when cooking! The rule of thumb is never to cook with a wine you wouldn't be willing to drink. Many recipes call for wine and people use 'cooking wine' from a grocery store. Don't be that person. Use real wine and drink the rest of the bottle with dinner! Also, this makes for a really impressive date night. The converse of this rule is don't break out the 'good stuff.' If you're cooking with wine that cost more than $15 a bottle, you're wasting it. Same goes with beer. That micro-brewed 'hipsterweiser' may be delicious, but the cooking process destroys everything that distinguishes it from mass-produced beer." "Putting your bread in the refrigerator doesn't keep it fresh. I cannot count the number of times I have watched well-meaning friends take cakes, cinnamon rolls, fresh baked breads, and stick them in their refrigerator to keep them fresh until morning. What they do not realize is that the refrigerator causes the moisture in these items to condense or crystallize, causing dryness or soggy spots depending on initial moisture levels. It is just about the worst thing you can do for these delicious items. Another one I despise is the comment that salt and pepper go together. Sure, it sounds great from the standpoint of many foods, but when is the last time you peppered your peanuts or popcorn? Do you want pepper in your cake? Salt is a flavor enhancer that is used in many ways, but pepper is a flavor that has wide, but limited use. My final pet peeve is the comment that some people are natural born great cooks. I do not buy it. Some people have more enhanced senses of smell and taste that allow them to discern the proper balance of flavors with greater accuracy, but when they get a cold or an allergy attack, that advantage can evaporate and their food quality declines. At this point, the person who has learned how to cook by using recipes and then gently massaging the taste wins every time. Cooking is a skill that you learn, not an inborn talent." "All that brown stuff on your pan after you brown some meat or veggies? Use it! That's called fond, it's freaking amazing and will make your sauces have way more depth. You can easily get it off the bottom of the pan with a little wine, which is called 'deglazing.' When I make beef stew, I coat the beef in flour specifically to deglaze my soup pot. Coat the beef in flour, salt, and pepper, and fry it in a half stick of butter and get it nice and brown. Then add a couple cups of red wine and deglaze, then add a couple cups of beef broth. This makes a nice gravy into which you throw some peeled whole pearl onions and then cook for about 2 hours, making sure to stir occasionally to prevent sticking. After the beef is super tender, throw in a couple chopped potatoes, carrots, and stalks of celery. Cook until the veggies are soft (about 30 minutes or so) and serve in bread bowls." "Been cooking pretty seriously for awhile and I cannot tell you how many times I've been missing one ingredient or significantly misjudged how long a recipe would take by not following this simple tip: Read the whole recipe before you touch anything including the directions. Then get all the ingredients together and measured before anything touches heat. Chop vegetables, slice meat, mix spices. Cooking is so much easier when you do the prep first and then just worry about what's in the pan when the heat is on. Prepping has been the biggest change in my food quality. No more overcooking/burning while I get the next thing ready to go. What do you think the kitchen does all afternoon between lunch and dinner service? They get things together so the actual cooking is way faster and easier. Pretty much the definition of what's called 'mise en place,' which means to get everything in order and in place." "Wash your darn rice! It's easy and it makes the rice so much better. Swirl the rice in cold water until the water runs clear to get rid of the extra starch. This makes the rice fluffier and less sticky, seriously, it's a game changer. Also, because rice is processed and stored in bulk, there's bound to be dust or contaminants in it, so it's a good idea just in case. Lastly, cook rice with chicken broth instead of water - makes it taste a lot better." "Meats Do Not Need To Be Cooked To A Temperature Of 145-165º Fahrenheit"
"Meats do not need to be cooked to a temperature of 145-165º Fahrenheit. The reality is that the amount of time the temperature is held is just as important as the temperature itself. This myth is an oversimplification perpetuated by the FDA and many other food safety organizations. Scientifically speaking, you cannot reasonably eliminate all bacteria. Instead, to make food safe to consume you need to reduce the amount of bacteria, and this can be determined using a time-temperature curve. Thus, meats can be safely cooked at 130º F, granted it will take 2 hours once the meat has reached 130ºF. Solid, industrially raised meat only needs to be cooked on the outside in order to prevent foodborne illness. This is the reason why rare steak is safe. Bacteria does not penetrate muscle, so only the outside of solid muscle needs to be cooked to kill potentially harmful bacteria. Note: Wild animals have a reasonable chance of having an infection, meaning the bacteria is in the muscle; therefore, the internal temperature of wild game is important. Additionally, the internals of formed ground meat (e.g. hamburgers), and mechanically tenderized meat has been exposed to bacteria, and therefore the internal temperature is important. Chicken is an exception to this rule, as it has a much higher rate of Salmonella infection." "When chopping herbs, toss a little sprinkle of salt on the cutting board. It prevents them from flying all over the place. 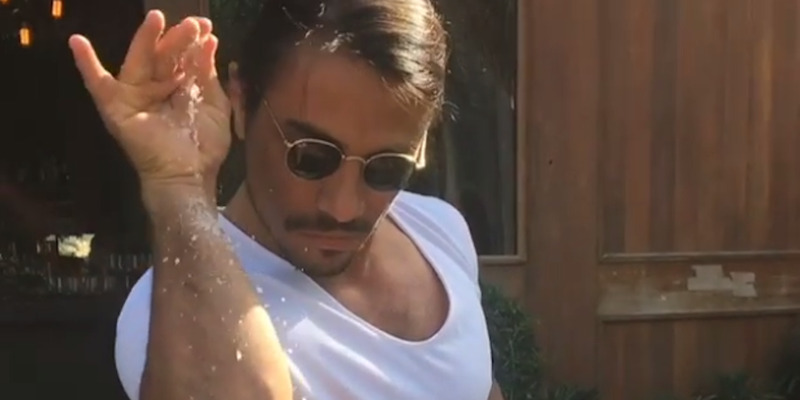 When seasoning meats, sprinkle down on the meat like it's snowing. I recommend 13 inches above the product, but this may make a mess in your home kitchen. I only do 13 inches in industrial kitchens, maybe 6 inches will work at home. And make sure it's nice and even, otherwise, that would be a salty surprise when you accidentally put way too much in one spot." "Baking Is A Science Experiment"
"When you're baking, follow the recipe exactly. When it says one teaspoon, it means one teaspoon. Not, 'Uh, that looks like a teaspoon.' Baking requires exact prep work, otherwise your finished product won't be right. Better yet, use a scale. Cooking is art, baking is a science experiment. When you're making a sauce or stew or whatever, you can throw a bit of flair in and deviate from the recipe. Baking, on the other hand, has been pretty much 'solved' in a lot of ways, and attempting to reinvent the wheel just gets you a crappy, doughy wheel that doesn't hold its shape. There's two sort of classes of ingredients when you're baking: first the base of flour, eggs, sugar, etc, and second the 'flair.' Messing with the base ingredients is a great way to destroy your dish, but 'flair' tends to be pretty easy to mix and match as you please. Take muffins for example; your base is usually the same unless you're doing a veggie bread like zucchini. But what makes muffins actually unique and good is the added second layer of ingredients, like chocolate/sweets, fruits, and spices. Once you're confident in your base recipes, it becomes much more like cooking in that you can substitute and edit ingredients as you desire. For example, I don't actually measure anymore for my personal sourdoughs. You can get a feel for the hydrations, how much starter to add, when it's ready for proofing, etc. It comes out a little varied each time, but I don't care enough to be perfectly precise." "Make as much as you can from scratch. Not only is it cheaper, but it will save time in the long run with bulk batches and will also taste considerably better. The only difference between you and a restaurant is experience and the number of things that are made in-house, both of which are completely achievable to change." "I'll admit, I haven't worked in every kitchen, but I have never seen a cast iron pan in a restaurant kitchen. I've about 15 years combined as a cook and as a refrigeration technician. They're heavy, break if dropped on the tile floor, and can be temperamental, especially after the dishwasher runs them through the dishwasher. I'm sure they're in a few restaurants for some specialty dishes, like blackened redfish, if anyone is doing that anymore. When we used pots and pans, they were aluminum or stainless. Home cooking is another story altogether. The pans probably won't be washed directly after being used, the non-stick surface isn't going to get beat on for 16 hours a day, every day, and time and care can be liberally applied to cast iron vessels. Do I have cast iron at home? You bet I do, best pans ever. I also have stainless pots (who the heck wants to boil something in a cast iron pot? Gross and bad for the seasoning) and a few, quality, non-stick pans, for example, a good 8-inch skillet is essential for over easy eggs." "I'm guilty of thinking that continually whipping cream was the only thing to do. Always the strict and fun-removed cooking instructor, I wanted my students to sweat some. But the truth is when whipping egg whites or cream, stopping in the middle and picking it back up a few seconds later (when that arm gets too heavy) doesn't make your whip fall apart. If anything, it helps by allowing the structure to set and firm up a little. Just don't remove your whisk, leave it inside your liquid at all times, and restart at medium speed, not at full bore. Speaking about myths, you don't need a special whisk for stuff. The whole idea of whisking is the integration of air into a liquid - get the one with the most spokes, cheap or expensive, and if you still find yourself having issues use two whisks at once, you'll see the insane difference." "Too many people think you're supposed to put knives in the dishwasher. Butter knives and maybe individual steak knives are one thing but don't put a cleaver in with the dirty dishes - hand wash that sucker. Don't hit your blade with a sharpener every time you have trouble cutting something either. Get a hone and learn to use it properly. Grinding a bent edge is gonna grind it off at a weird angle, use a hone until it doesn't make a difference anymore, then sharpen it. If you have a knife block, put your knives in upside down, it'll help save the edge as long as possible. Hand wash and towel to complete dryness any knife you really want to keep sharp."